2 APOSTLES’ CREED (1st Article) I believe in God the Father Almighty, maker of heaven and earth. (2nd Article) I believe in Jesus Christ his only Son our Lord who was conceived by the Holy Spirit born, of the virgin Mary, suffered under Pontius Pilate was crucified, died, and was buried. the third day he rose again from the dead. He ascended into the heavens and is seated at the right hand of God the Father Almighty, from there he will come to judge the living and the dead. (3rd Article) I believe in the Holy Spirit, the Holy Christian Church, the Communion of Saints, the forgiveness of sins, the resurrection of the body, and the life everlasting. Amen. 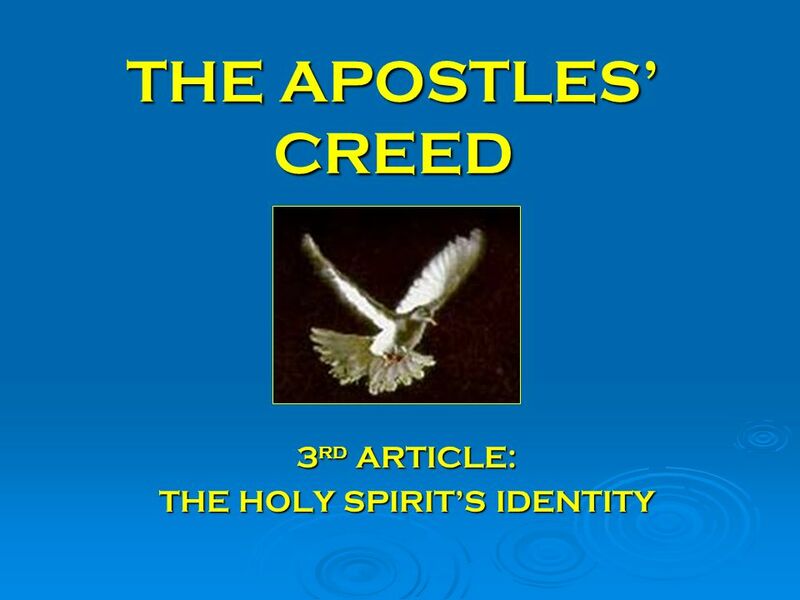 Download ppt "3rd ARTICLE: THE HOLY SPIRIT’S IDENTITY"
In Mass, we celebrate two Liturgies: The Liturgy of the Word, and the Liturgy of the Eucharist. These two liturgies unite to form a single act of worship. 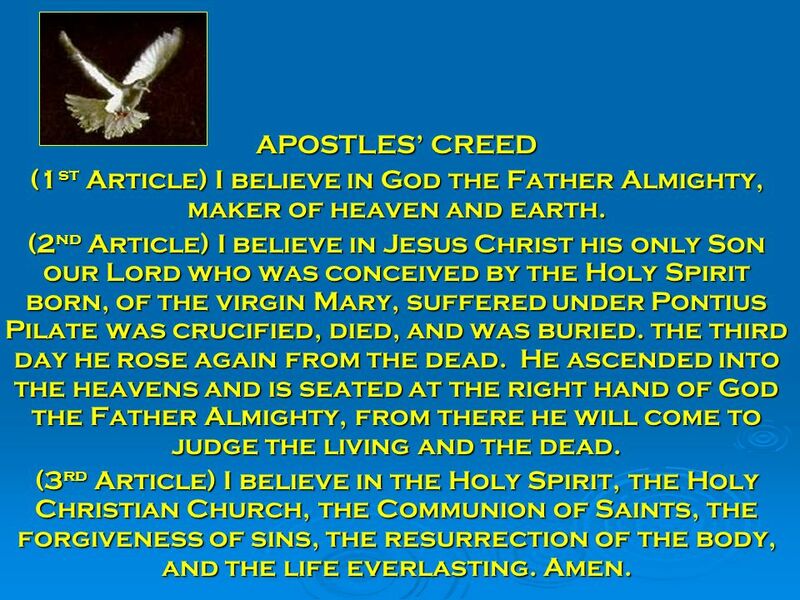 Apostles’ Creed I believe in God, the Father Almighty, creator of heaven and earth. The Divine Mercy Chaplet. THE OUR FATHER OUR FATHER, WHO ART IN HEAVEN, HALLOWED BE THY NAME; THY KINGDOM COME, THY WILL BE DONE ON EARTH AS IT IS IN. The Parables of Jesus The Poison of Refusing the Banquet (Prodigal Sons) Luke 15:25-32. THE APOSTLES CREED I believe in God, the Father almighty, creator of heaven and earth. Apostles’ Creed Crossroads Series of Brown-Roa Chapter 1 The God of Our Ancestors 1 I believe in God, the Father almighty, Creator of Heaven and Earth. Hey, hey…more controversy by: chris kazun. Theist – believes in God Atheist – denies God exists Agnostic – Doesn’t know. Baptism and You Matthew 28: “All authority in heaven and on earth has been given to me. Therefore go and make disciples of all nations, baptizing. Heresy, Orthodoxy, & the Bible: The Gnostic Challenge. Galatians 1:1-10 What is the Gospel? Peter Fitch, St. Croix Vineyard Sunday, September 23, 2012.
Review Trinitarian Proof Today The Relationship within the Trinity: The Father and Son. (pray while holding the crucifix on the Rosary) The Apostle's Creed (pray while holding the crucifix on the Rosary) In the name of the Father and. Vocabulary Test  Aquinas, Thomas  Arminianism  Ascension  Medieval Italian theologian; Summa Theologica ; Aristotle; Five Ways  James Arminius; Response. Nicosia International Church From the nations … to the nations. What in the world is God doing? The Saving Three. Growing in Faith Intentional Christian Living Session 4. Second Coming Chapter 26 Lesson 1.